Color composite image of the nearby quasar HE0450-2958, which is the only one for which no sign of a host galaxy has yet been detected. The mid-infrared part of this image was obtained with the VISIR instrument on ESO’s Very Large Telescope, while the visible image comes courtesy of the Hubble Space Telescope and the Advanced Camera for Surveys. Astronomers have long wondered which came first, the blackhole or the galaxy around it. The leading theory holds that the two co-evolve,starting small and building over time. But colossal black holes may zap galaxies into existence fromscratch, new observations suggest. Astronomers recently observed a peculiar large black holethat did not belong to a surrounding galaxy as expected. Until now, scientiststhought that this black hole's hostgalaxy was merely shrouded in dust and rendered invisible to us. The black hole, designated HE0450-2958, is located about 5billion light-years away from Earth. It is a type of supermassive black holeknown as a quasar,which releases extremely brightjets of high-energy light. Researchers used the European Southern Observatory's VeryLarge Telescope to capture new observations of the quasar targeted to searchfor dust in long-wavelength infrared light. "Observing at these wavelengths would allow us to tracedust that might hide the host galaxy," said Knud Jahnke of the Max PlanckInstitute for Astronomy in Heidelberg, Germany, who led the observations. "However, we did not find any. Instead we discovered that an apparentlyunrelated galaxy in the quasar?s immediate neighborhood is producing stars at afrantic rate." ?The astronomers think the black hole is powering starformation in the nearby galaxy by sprayingits jets of high-energy particles toward it. In fact, the quasar could havetriggered the galaxy's formation in the first place when its energetic jets hitnearby clouds of gas. And as time goes on, the neighboring galaxy will likelygrow to encompass the black hole at last. 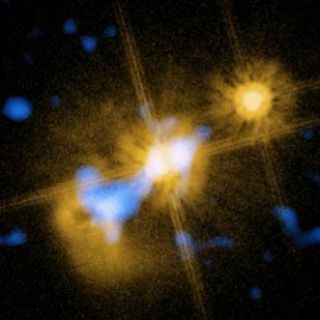 "The two objects are bound to merge in the future: Thequasar is moving at a speed of only a few tens of thousands of kilometers per hourwith respect to the companion galaxy, and their separation is only about 22,000light-years," said researcher David Elbaz of? the Service d?Astrophysique,CEA Saclay in France. "Although the quasar is still 'naked,' it willeventually be 'dressed' when it merges with its star-rich companion. It willthen finally reside inside a host galaxy like all other quasars." The astronomers detailed their findings in a paper publishedrecently in the journal Astronomy & Astrophysics and an upcoming paper inthe Astrophysical Journal.